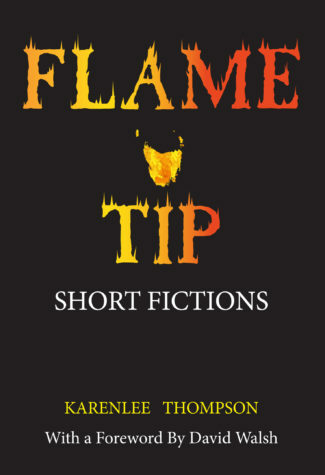 It’s only three weeks since I posted about my reading of Karenlee Thompson’s new book, Flame Tip, a collection of short fictions loosely themed around the catastrophic Black Tuesday Bushfires in Tasmania in 1967. The 50th anniversary of those fires was February 7th 2017 but already this fire season has claimed its victims, making me wonder why more Australian authors haven’t tackled this theme. Fellow Tasmanian Amanda Lohrey did, in her novella Vertigo (see my review), Roger McDonald wrote about a young arsonist in The Slap (see my review) and Delys Bird edited a collection called Fire (see Karenlee’s guest review). But for a natural disaster which looms so large in our national consciousness, it’s strange that I don’t know of any others except a brilliant children’s story called Ash Road by Ivan Southall. In my previous post about this book, I explained that I’d only read four of the fictions because I only had an advance PDF copy. Would I have read that if it had been by anyone else other than Karenlee who has contributed so much to this blog? No. I loathe reading PDFs. If there is anything worse than reading on a Kindle, it is reading a PDF on a computer. So you will understand why I was so pleased to receive a copy of the real thing yesterday, and to loaf in bed this morning, enjoying the simple pleasure of holding the book in my hands and reading it. (Kudos to the book designer, BTW, it’s by Art on Order). The thing is, reading a real book is different. Lately some of my Facebook friends and Twitter pals have been alerting me to scientific studies which show all kinds of interesting results… all of which seem to point to what some of us knew all along. We remember what we’ve read better when we read it in a real book. Guided by our brains which tell us where on the page to find it, we to-and-fro among the pages when we want to revisit an image or clarify our understanding. Our senses journey with us as we feel the heft of the remaining pages, scampering along towards an exciting climax or moving slowly when we don’t really want the book to end. And we comprehend better when we read it in a real book. In my previous post I mentioned a piece called ‘Lost’. This piece takes the form of a Lost-and-Found notice in a newspaper, and over two pages it lists the belongings lost in the fire. Reading the whole collection made me realise something else: that Karenlee’s choice to make this collection ‘loosely-themed’ around the fires was an appropriate one. None of us ever drive through dense bush in summer without a momentary apprehension because bushfires are an unavoidable part of Australian life. Every year we see them on TV somewhere, and every year we dig deep for the relief effort. Memories and fear are tucked deep into our consciousness, and – even for those of us never directly affected – they surface into everyday life many years after the event in strange, unpredictable and inexplicable ways. Fiction, and a careful choice of narration as in these stories, unravels the pathways of these memories and fears. Fiction also allows for revelations I had not considered. In ‘Degustation’ one of the hungry little girls from up the hill with no shoes and no home, wearing a floral blouse that’s two sizes too big and a torn plaid skirt has grown into a woman dining with a profiteer who bought up all the available charred and rubble-ridden farms in the district after the fires had rendered the singed locals almost comatose with shock. Source: Review copy courtesy of Hybrid Publishers. The Narrow Road to the Deep North has a Tassie bushfire (and an improbable escape). Can’t think of any bushfires in early Australian writing, though from memory there’s a big grassfire outside Canberra in MF’s Old Blastus of Bandicoot. Do you know, the scene that obliterates everything from that book for me is the men struggling through the mud on the line. Great review Lisa – I’m a short story fan as you know:) In my classes, I’ve had my students write poems and stories on the theme of bushfires, sadly fire is part of an Australian summer – and it seems to be getting worse. Ash Wednesday is a personal memory for me – my brother lived at Cockatoo, his kids hid under blankets until rescued from the kindergarten and luckily he managed to save his house with just a scorched kitchen – unfortunately his marriage never survived the aftermath. A lot of ongoing trauma and hidden stories from catastrophic events which Karenlee seems to have covered. Hope her book does well. And I’m with you regarding digital reading – give me a real book any day! So sad that your brother’s marriage never survived Mairi. Bushfire does indeed scorch people’s lives in ways that even they are sometimes unaware. I listened to many of the survivors of Black Tuesday speaking on ABC local radio over the 50th anniversary commemorations and it was sometimes very heartbreaking to listen to. Let’s hope your brother’s children were young enough (like I was) to remember the adventure without too much of the trauma. Adults, of course, don’t have the same memory-warping capabilities. Thank you for those very kind words, Karenlee – I think each disaster society has we learn a little each time how better to help survivors. Nowadays there is trauma counselling available – not so much for Ash Wednesday. My sister-in-law lost her house in bushfires, and her marriage barely survived. I think Thompson has done a great job of capturing the trauma of fires. Yes, without being heavy-handed about it. I don’t know how she does it, I find the annual fire season overwhelming though it’s not so bad now I’m retired and having to take responsibility for my school’s safety in an at-risk area. Well I’m glad you’re retired then! You don’t need that stress! But yes, re the book, she conveys the trauma without actually weighing you down and yet leaving you in no doubt as to its cost. I have ‘Flame Tip’ as a birthday gift and so far have only read ‘Lost’ and ‘Degustation’ both of which packed a real punch. So this is just a preliminary message of congratulations to Karenlee and Hybrid. Karenlee has been a kind mentor to me so this is a good opportunity to thank her for her encouragement. I like her sub-title, ‘short fictions’ and would be interested to read a discussion about the short story genre. What is it? Descriptors seem to range from ‘tales’, ‘stories’, ‘yarns’, ‘anecdotes’, ‘memoirs’, ‘ramblings’ – I’ve come across them all on title pages. I don’t believe any of the academic definitions I’ve seen so far. I rather think a ‘work’ is either interesting or not; and ‘Flame Tip’ is promising to interest me greatly. Oh, that is a very good question, Ros! When categorising types of fiction for this blog I wanted to distinguish between short stories and novellas, to differentiate between what I found in collections and what is generally published on its own in a book rather like a short novel. I hunted around online for something to guide me, but in the end – because I thought it would be the most useful as a guide – I went for the crude arbiter of length, i.e. the number of pages, i.e. <100 pages is a short story and 100-200 pages is a novella. In no time at all this definition failed because Madame De is only 80 pages long but it's published by itself as a book, and Text Classics collection of Stead novellas puts four of them together in one book. And then, yes, that very short but incredibly powerful piece of fiction called 'Lost'. It's not a story, or a yarn, or a memoir, or ramblings. It takes the form of a non-fiction advertisement that we find in the newspaper personals, possibly a form becoming obsolete and perhaps deliberately chosen for that reason, to set the piece in time. (People don't advertise their lost dogs or possessions in the paper any more, they appeal for help on Facebook and Twitter, with pictures). Modern writing is very varied, but the recent publication of The Collected Stories of Pinchas Goldhar shows that there is still a place for stories similar in style to Barbara Baynton and Henry Lawson. That is a great discussion you’ve opened up Ros and I did choose ‘short fictions’ quite deliberately because the connotation of ‘story’ is a difficult one to pin down. I’m looking forward to reading this. Interestingly, TMAG in Hobart has an exhibition on right now because it’s the 50th anniversary of the fires. I noted the short fictions nomenclature Ros, and wondered whether in this case she includes flash fiction and other “forms”. Nomenclature is always interesting. I read a blog post this week which listed Conrad’s Heart of darkness as a short story whereas I’d see it as a novella. In the end I don’t think it matters – what matters is the work itself and whether we like it. Me too, I wouldn’t call Heart of Darkness a short story either! Oh, and yes, Karenlee’s stories vary considerably in length. Yes, I think so, but then most are a challenge I think. He’s done WW1, migrants, indigenous exhibitions. They have all had their political and personal issues. Ah! Such a talented family!! Well, one which gravitated to libraries/archives/museums anyhow. He’s a great reader so we share that too. Reading on PDF files isn’t easy, I agree with you. I think you can send your PDF via your personnal kindle email address to Amazon. If you put the word “convert” as the object of the mail and attach the pdf, the file comes back in kindle file, gets added to your kindle library and you can read it on your kindle. I tried this once, a long time ago, to read a PDF on the kindle, but it didn’t fit the size of the screen very well so I had to keep scrolling all the time to read it in a font size that was big enough. The Education Department here used to send mega PDF files about their latest initiatives to school leaders, I don’t miss those at all! You can read pdfs on the kindle. But what I meant that Amazon can convert a pdf into an aw file and it becomes a kindle book, not a pdf. Now I’ve read this review properly and of course I agree with you re its value. I’m also interested in the issue of fiction about bushfires, and am thinking a Monday Musings, though I’m not sure I have much more to add besides the ones you’ve named (except I believe Eliza Henry-Jones new book Ache is also about bushfires). Yes, I’ve read Ache. There’s also Lexi Landsman’s The Ties that Bind. And Amanda Lohrey’s Vertigo and The Slap by Roger McDonald. And I see from my review that Ada Cambridge makes mention of bushfire in 30 Years in Australia too! Thanks Lisa. And of course there’s that fire in Narrow road to the deep north too.